This flavorful one pot dish includes juicy chicken thighs, slices of onions and fingerling potatoes. 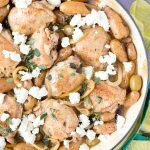 Mixed Greek olives, lemon slices, fresh oregano and feta cheese tossed in at the end celebrate the flavors of Greece in an easy recipe you'll love! Preheat the oven to 350 degrees. Rinse the chicken thighs and pat dry with paper towels. Salt and pepper both sides of the thighs and set aside. In a 3 ½ quart braiser (or a Dutch oven or large heavy skillet with lid), heat the olive oil and butter over medium-high heat. When it is shimmering, place the chicken thighs skin side down into the pan. Gently move the thighs while cooking to ensure the skin does not stick to the pan and pull off the chicken when flipped over. Flip over after 5 minutes and cook for more 5 minutes. Remove the chicken from the pan and set aside. Reduce the heat to medium and add the onions. Sauté until onions are limp; approximately 4 minutes. Add the garlic and lemon slices, and sauté 2 more minutes. Raise heat back to medium-high and add the chicken stock and lemon juice (be careful of any hot splattering of the liquid). Scrape the bottom of the pan with a heatproof spatula to release any pan drippings into the liquid. Simmer for 1 minute. Add the chicken thighs back into the pan (skin side up) as well as the olives, oregano and fingerling potatoes. Cook, covered, for 35 minutes. The final temperature should register 165 degrees on a meat thermometer. Optional: To crisp the skin, place the pan underneath the broiler for 1-2 minutes (be sure to watch that chicken skin does not become over done) before removing from the oven. Serve the chicken thighs with a side of potatoes, drizzled in some of the pan sauce.